For centuries, the diamond has been desired and coveted. While sapphires, rubies, emeralds, and other coloured gems can paint a piece of jewellery in vibrant colours, it is the diamond that sparkles with fire, adding brilliance to any piece. The diamond has long been a symbol of privilege, and is one of the most appreciated gems the world over. Diamonds are essentially made of carbon, and are formed when carbon deposits in the earth are exposed to extremely high temperature and pressure for an extended duration. They are formed between 100 and 200 kilometres below the earth's continental crust in what is known as the graphite-diamond equilibrium boundary. The diamond is the hardest naturally occurring mineral on earth and can cut any other mineral or gem. It is ranked 10 on Moh’s scale of hardness. Diamond and graphite are both made of carbon, but what differentiates it from graphite is its crystal structure, because of which a diamond is so hard. The term 'diamond' itself means 'unconquerable' and is derived from the Greek word 'Adamas'. However, while a diamond is the hardest gem, it is only of moderate toughness. Toughness refers to the resistance of the gem to breaking and chipping, which determines whether or not it will fracture easily. A diamond's toughness is moderate because it can fracture more easily along cleavage planes than gems such as the sapphire. Cut: The cut of a diamond implies shape and proportions. Shape of a diamonds refers to the outline of a diamond. Round cut diamonds are most common and preferred shape and is widely used in jewellery. 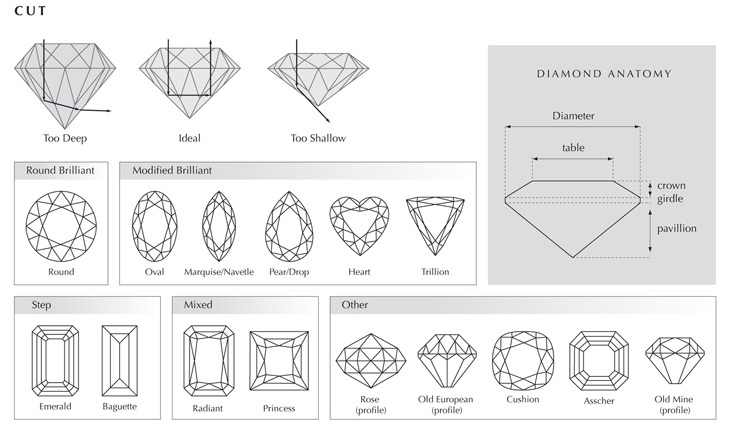 All other shapes are referred as Fancy shapes and include traditional outlines like Oval, Marquise, Pear and Emerald. Modern fancy shapes like Heart, Cushions, and Triangles are also gaining popularity. As a value factor, cut of a diamond refers to its proportion, polish, and symmetry. As an example a round brilliant cut diamond has 57 or 58 facets (1 Table facets, 8 star facets, 8 bezel facets, 16 upper girdle facets on crown and 16 lower girdle facets and 8 pavilion mains and maybe a culet on the pavilion). The proportions refer to relationship between tables size, crown angle and pavilion depth. A diamond faceted in the 'brilliant' style may be of either ideal cut, shallow cut, or deep cut. The cut of a diamond determines its brilliance and fire, as it strongly influences reflection of light from within the diamond. In an ideal cut, most of the light which enters the diamond is reflected perfectly off its facets back into the observer's eye. A diamond that is of ideal cut is likely to have high brilliance. In a cut which is too shallow or too deep, less light is reflected from the flat top (or table) of the diamond. The faceting of a diamond in a shallow or deep cut allows for light to leave the diamond from the sides or the bottom as well as the table, thereby reducing the amount of light reflected from its table. The Gemological Institute of America (GIA) five-tier scale for grading a diamond's cut is widely accepted in the industry and ranges from excellent to poor. Three of the most important characteristics of a polished cut diamond that reflect its cut grading are brilliance, fire, and scintillation. Colour: Diamonds come in a wide variety of color. The diamonds most commonly used in jewellery are diamonds which fall in “Normal Color Range” range from colorless to near colorless with slight tint of yellow or brown. The value of diamonds is based upon on how close they approach to being colorless – the less the color, the more the value (an exception being for fancy color colored diamond where more the color, more valuable it is). The GIA follows an alphabetic scale to determine the colour of diamonds, which ranges from D (a colourless diamond) to Z (a diamond with a noticeable increase in light yellow or brown hue). Each letter grade has clearly defined range of color. The color of diamond is observed under precise lighting and controlled viewing directions. Fancy coloured diamonds do not fall within this scale, and have been discussed in more detail below. Clarity: As is the case with most gems that form naturally, diamonds may contain few inclusions, either within the stone or on its surface as a direct result of its growth environment. Diamonds clarity refers to absence of inclusion (characteristics within the gem) and blemishes (characteristic confined to the surface of a gem). A diamond without these characteristics is very rare and hence affects its value. Diamond clarity is determined under 10 x a magnification which is internationally accepted. A diamond's clarity is graded based on the size, number, position, nature and relief of the inclusions it contains. Included (I1, I2 and I3). Crystal: A three dimensional mineral confined within a diamond. Pinpoint: A very small crystal that appears like a dot at 10x magnification. Needle: A thin and short crystal that looks like a rod. Cloud: Several pinpoints lying together. Feather: a break in a gemstone that extends from the surface to the interior, often bright and feathery in appearance. Twinning Wisps: A series of pinpoints, clouds or crystals that forms along a diamond's growth plane. Cavity: An angular opening created when part of a feather breaks away. Indented Natural: A portion of the diamond's rough or original surface that dips below the polished surface. Knot: A crystal that extends to the surface. Natural: A portion of the diamond's rough or original surface left on a polished stone, usually at the girdle. Polish Lines: Fine, transparent or white parallel grooves and ridges left by polishing. Carat: A "carat" is a standard unit of measurement used for diamonds and gemstones. The term is derived from carob seed, which are remarkably consistent in weight and were used for balance scales. One carat is equivalent to 0.200 grams or 100 points. When one piece of jewellery has multiple diamonds in it, the total mass of all the diamonds or gemstones in the diamond is known as the "total carat weight."